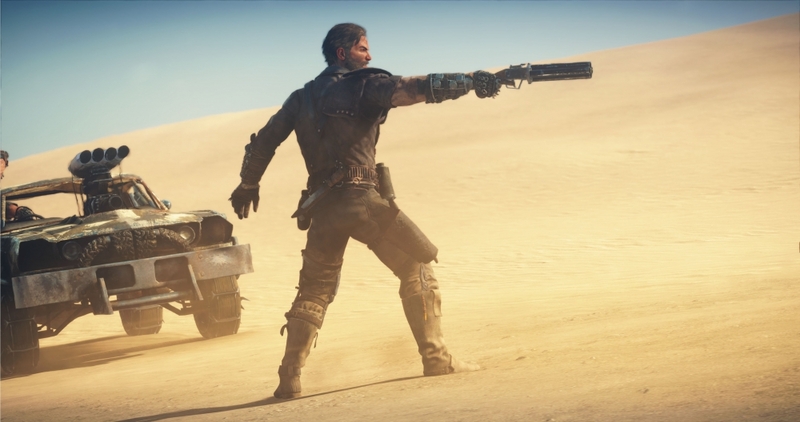 Mad Max is an open-world, 3rd person adventure game from Swedish developer Avalanche Studios, and published by Warner Bros. Interactive Entertainment. The game is based on the movie franchise, with an original storyline created specifically for the game. I was eager to play Max as I enjoyed the Mel Gibson films, and to a lesser extent the recent Tom Hardy reboot. 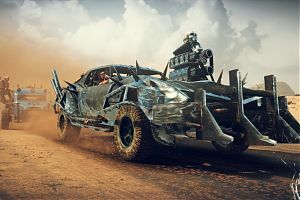 Mad Max is set in a post-apocalyptic dystopian future and begins with Max being ambushed and stripped of his worldly belongings: his clothes, his weapons and his beloved Interceptor – The Black On Black, by warlord and protector of GasTown Scarbrous Scrotus and his Warboys. 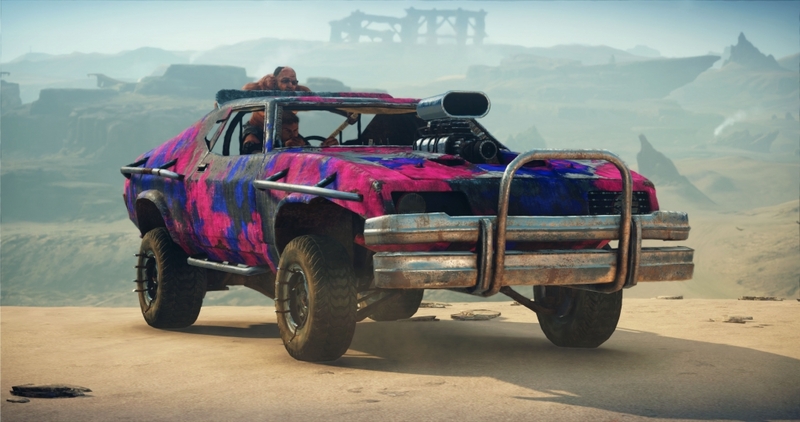 Max wanders the desert, picking up an substitute weapon (a shotgun), and coming across a hunch-backed “black finger” (the wasteland term for a mechanic) called Chumbucket, who has had a vision of Max’s arrival and that together they would create the world’s greatest car – The Magnum Opus. The duo form an alliance to this end. 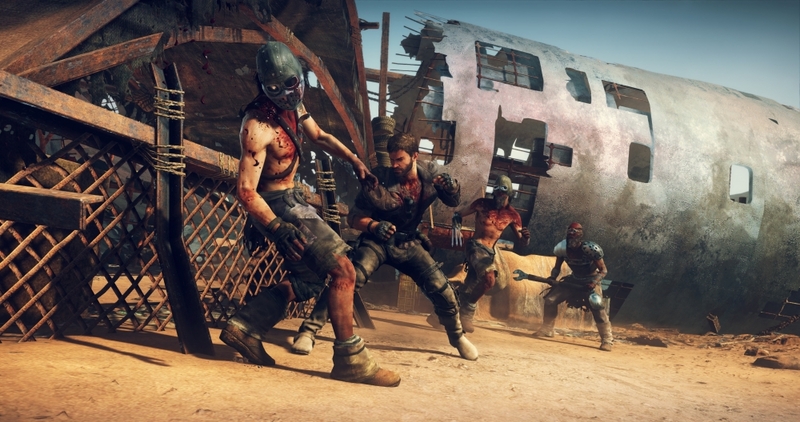 To get the necessary parts to complete your vehicular masterpiece you must work your way through the wasteland towards GasTown and a showdown with Scrotus. 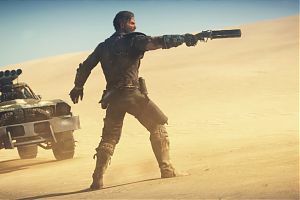 The wasteland environment is massive, bigger than the majority of games; Avalanche Studios have created a harsh, desolate world that looks exactly like the movies – barren and almost oppressive. The sun glares over mile upon mile of desert, rusting hulks of ships and crumbling, decaying concrete. The scenery changes ever so subtly dependent on which territory you’re in, from canyons and caves in one area, to an arid desert the appeared to have once have been a seabed in another. Just like the movies, Max is a gruff and unforgiving loner – visually a mix of both Gibson and Hardy – although he retains Gibson’s Australian accent from the original movies. Chumbucket reminded me of a cross between Gollum from Lord Of The Rings and Ephialtes, the deformed Spartan from 300. Vocally, Chumbucket sounds like Dennis Hopper’s Deacon from Waterworld, spouting religious-fervour towards Max (calling him “Saint”) and the Opus (“a righteous cause indeed”). 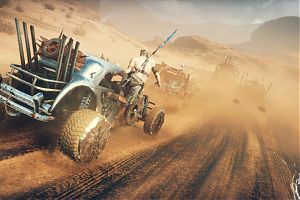 Mad Max is first and foremost a driving game, if you’re not a huge fan of driving, look elsewhere as you will be spending a hell of a lot of time behind the wheel of the Opus, as you gradually upgrade it from a blank canvas to the most kickass vehicle in creation. The driving mechanics are easy to get to grips with, as Avalanche have opted for the standard layout for brake and accelerate (the right and left shoulder buttons respectively), whilst the face buttons control secondary functions like weapons and speed boost. Left thumbstick controls steering and right controls camera view. From the get-go the car feels meaty and easy to handle. 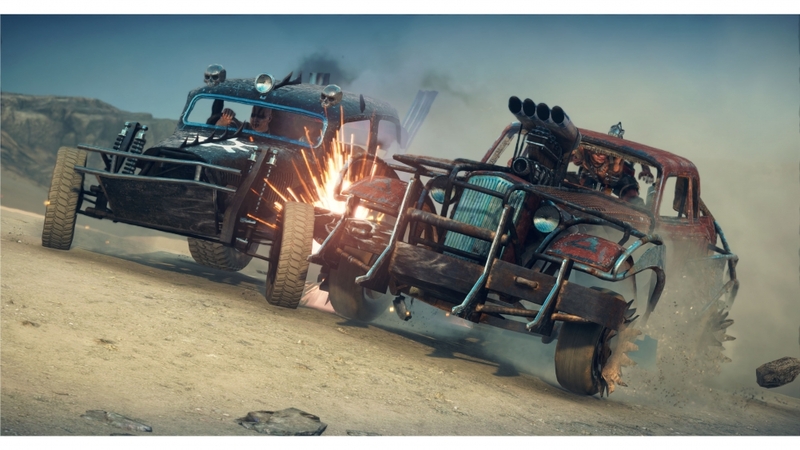 Vehicular combat makes up a large part of the driving stages of the game, which is a little fiddly at first, but I soon became comfortable with the inevitable showdowns. Enemy vehicles fall into different categories – with different levels of armour and weaponry. You have different options to dispose of them – ramming and sideswiping, shooting them with Max’s gun or wrenching the driver out through the windscreen using a harpoon to name but a few. The car doesn’t have unlimited fuel – or as Chum calls it “guzzle-ene”. The Opus can only carry one jerry can of fuel as well as what’s already in the tank. This forced me to plan my route from A to B a bit more than just following the waypoint suggested by the in-game map. I often found I needed to divert and find some fuel otherwise I would’ve had to walk back to my point of origin. Whilst driving you can opt for either 3rd or 1st person view. If the Opus takes too much damage, it’ll explode. 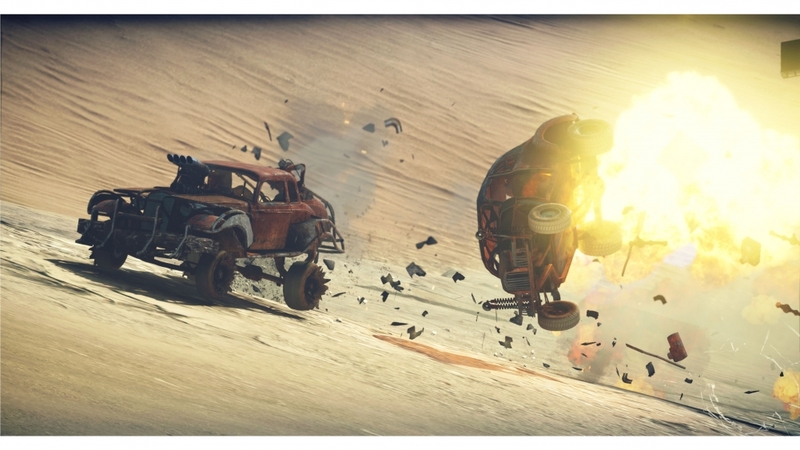 Sometimes it’s best to jump out, let Chumbucket repair the vehicle and play chicken with the attacking vehicles. Eventually the drivers will get bored and approach you on foot. In order to reach Max’s ultimate goal – GasTown, you forge allegiances with lower level warlords and help to reduce Scrotus’ grip on their respective territories. This is where the game’s side missions and ancillary tasks fall into the equation. Each warlord has their own plan for the survival of their followers, sending Max out to obtain one item or another. Throughout their regions you’ll find beacons to tear down (known as Scarecrows), minefields to defuse and enemy camps to infiltrate among other tasks. These camps hold parts needed to upgrade each warlord’s stronghold for the better – an armoury or a water storage facility for example. 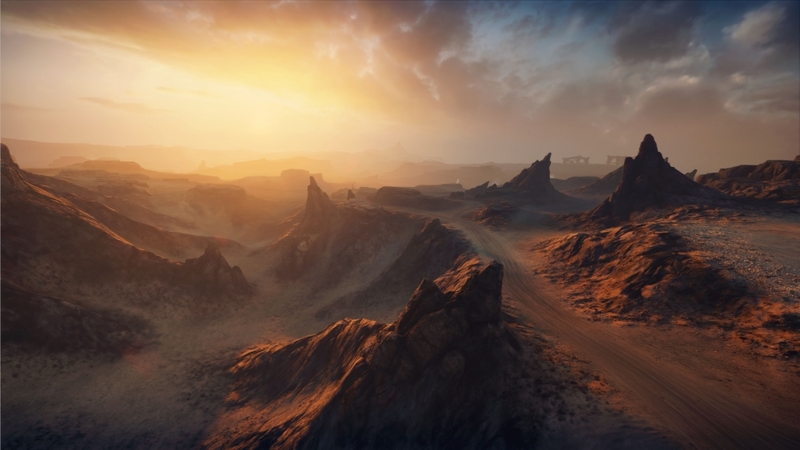 Vantage points – dirigibles – help you to find these points of interest, as well as doubling as fast travel points; which are much needed with a playing area as big as Mad Max’s. 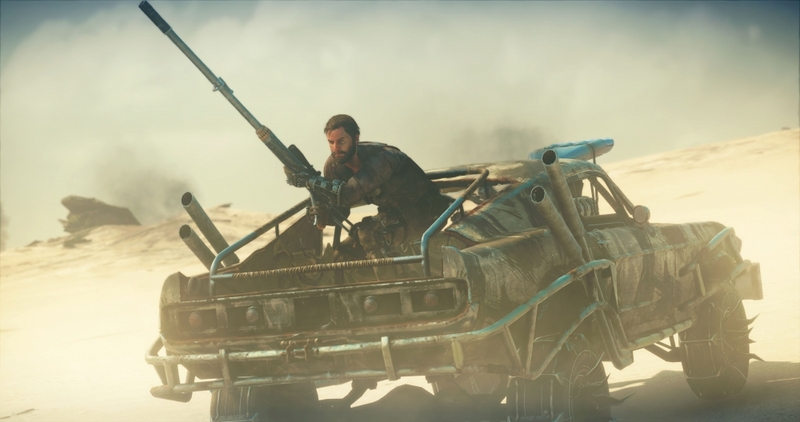 Upgrades to the vehicle and to Max’s abilities come from collecting scraps (of metal and parts) found throughout the game – from defeated vehicles, looting bodies and exploring Scrotus’ encampments. More and more upgrades become available the further you progress. Ammo is scarce, which ensures that you conserve it unless in an emergency situation. Max can only hold a finite amount of rounds, which again reinforces the need to preserve your primary weapon. Max’s abilities can also be improved by seeking out Griffa, a wandering mystic that seems to have an obsession with Max’s progression. Max’s health is replenished by water, which can be found at various locations in the game, although they are spread far enough apart that panic can set in if you’re low on health. Enemy camps and looting sites are pretty safe bets. Max can also restore health with a hearty meal of either dog food or a feast of maggots from a ripe corpse. Water can be carried in a canteen, whilst food has to be consumed where ever it’s found. On foot, Max can explore his environments in order to collect scrap and locate collectible relics of the past – glimpses into what life was like before the world went into meltdown as well as how society gradually degraded in the aftermath. 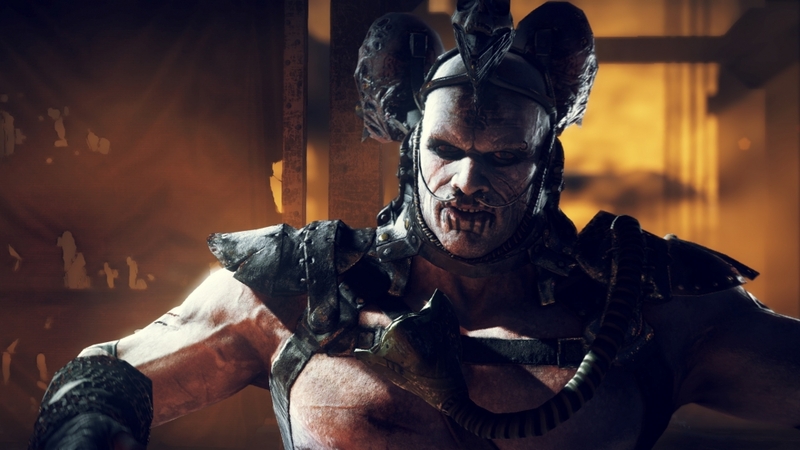 Within enemy camps, Max can duke it out with Scrotus’ Warboys. 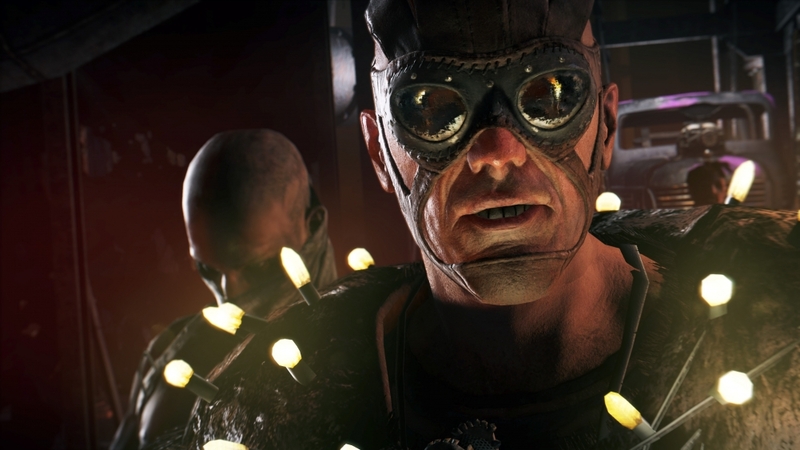 Melee combat is based on the Batman: Arkham’s engine – although Max is more of an all-out brawler than The Dark Knight, swinging haymakers at incoming enemies rather than Batman’s smooth hand-to-hand skills. This fighting style makes sense as it’s not like Max would’ve been able to train in martial arts in an apocalypse. What Max does have is the ability to fly into a rage-like state for a limited time by landing enough strikes together into a chain attack. Max must’ve been a wrestling fan before civilisation ended, as in this state he finishes off foes with powerful moves like suplexes, clotheslines and powerbombs. As with Batman, incoming attackers can also be parried or dodged before launching an offensive strike and pick up dropped weapons for a limited time. The best melee weapon by far is the Thunderstick – a staff with a gunpowder shot head that explodes on impact. Max can either hurl this like a spear or ram it into a Warboy’s chest at close range, blowing the poor sap into smithereens in the process. With the camps, War Criers will rally troops to your location, buffing them to near indestructible levels unless you take the crier out before a gauge at the top of the screen fills. The only way the game shows tell you to do this is smash the crane that the War Crier is suspended from, although I found I got battered by enemies trying to do this and that it was much easier to shoot them with my shotgun – like Indiana Jones against the scimitar swinging thug in Raiders Of The Lost Ark! 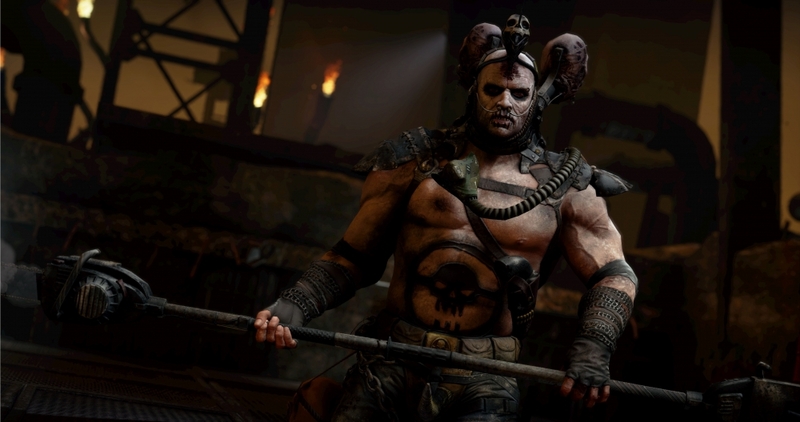 Warboys, much like the vehicles, vary – looks wise mainly, although some can dodge your flailing arms and others have weapons and shields. 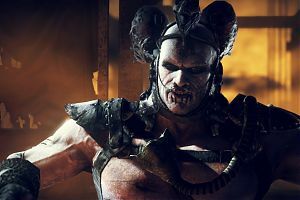 None are too difficult in small groups of two or three, but up against a half dozen or more, it’s best to use your precious ammo against the specialised Warboys and going toe to toe with the lower level guys. During exploration, Max doesn’t have any parkour-style skills, and can only climb predefined objects – handily spray painted yellow. Max does have the ability to jump, but only a few inches off the ground, if you accidentally slip off a ledge, you’ll have to run and climb all the way back to where you were. This is beyond frustrating, I really can’t understand why Avalanche gave Max the ability as it’s of no benefit whatsoever. Graphically the game is amazing, and perfectly catches the look and feel of the movies it’s based on. The cut-scenes feel like you’re watching another installment. In game, I did find a few glitches, such as Max deciding to breakdance up a wall whilst running down some stairs, and the Opus tumbling end over end with Max underneath and miraculously surviving. The sound effects and voice acting are spot-on, although Chum’s lack of interior monologue can be annoying on some longer journeys – shut up and let me drive damn it! 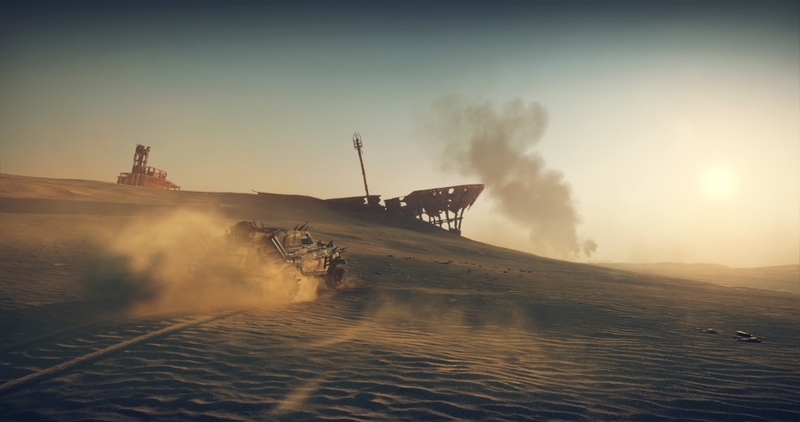 Apart from a few glitches, a sometimes annoying sidekick and the inability to jump over a matchbox, I did enjoy my time playing Mad Max. The main issue that may put people off is the sheer vastness of the environment. I cannot emphasis enough how much time you’ll spend driving and how far – I’d estimate the ratio of driving to on foot to be about a 60:40 split. Think of Max as a driving game with the ability to explore rather than the other way round and you’ll be in the right ball park. 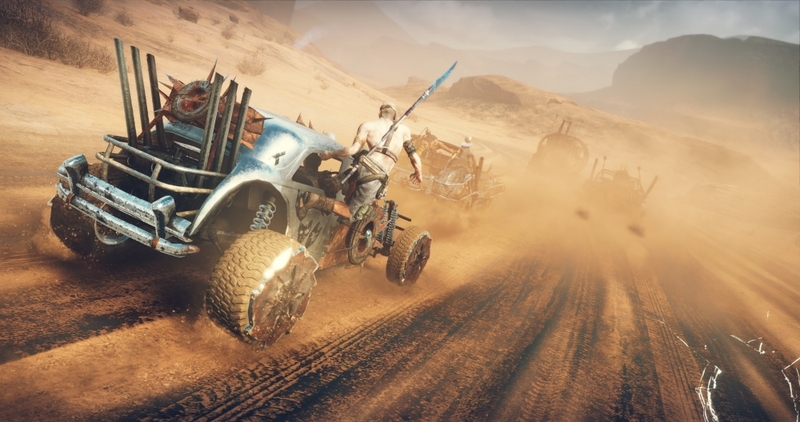 Basically if you enjoy road movies like Mad Max, you’ll enjoy the game. 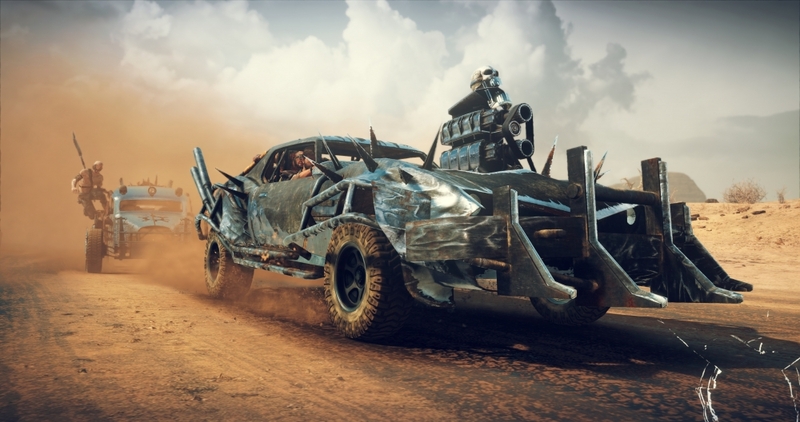 Mad Max is an adrenaline-fuelled homage to the movies – fast, furious and fun. But best left alone if you prefer exploring on foot. 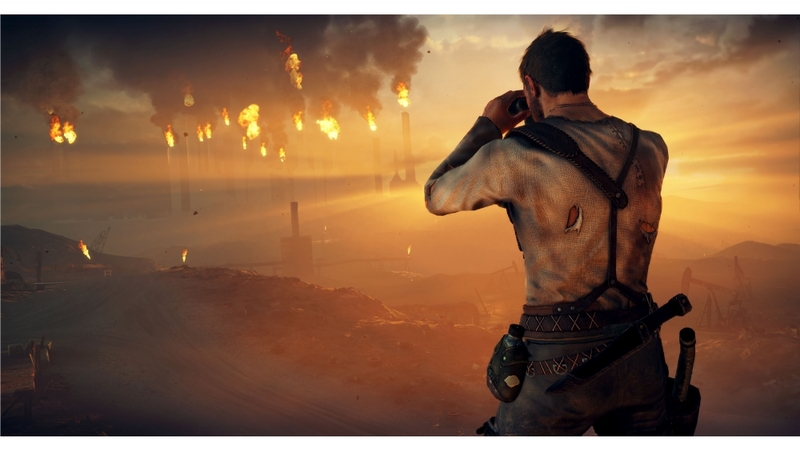 This review is based on playing the PlayStation 4 version of Mad Max that was kindly provided for review purposes by Warner Bros. Interactive Entertainment.